The Living Values Education Activities curriculum is written for educators and other adults working with young adults aged 15 to 24 who are concerned about an increasingly violent world and a lack of respect for others. Living Values Education advocates the creation of a values-based atmosphere for young adults, and engaging them in such values activities that they are motivated and develop the skills to become co-creators of a culture of peace, caring and respect. Living Values Education Activities for Young Adults, Book 1 and Book 2 offer activities that promote self-respect, emotional intelligence, critical thinking, creative expression and values-based decision-making ability — the necessary wellspring of skills that enable youth to respond positively to an ever-changing and diverse society. A wide range of issues and personal and emotional skills are broached in these books in order to involve young adults in an enjoyable but serious exploration of values and anti-values in relation to the self, others, the society and the world. Core values lessons are offered in addition to ideas for different subject areas. Lessons that encourage skill-building for both left- and right-brain thinkers include imagining exercises, reflection points, mind-mapping, discussion, role playing, relaxation/focusing exercises, movement and songs. Learners are nurtured in making values their own through artistic activities, creative writing, skits and service learning. Given the increasing negative influences young people are exposed and subjected to, these updated and expanded books include more lessons which involve them in exploring their concerns and the development of positive corresponding intrapersonal and interpersonal social and emotional skills. A few of the areas addressed through a values lens are: self-talk, conflict resolution skills, dealing with bullying in assertive and proactive ways, reflecting on and creating their own guidelines for involvement in social media, learning how to encourage themselves in positive ways and manage and heal their emotions, human rights, being safe from being entrapped and sustainable development goals. Whether you are an educator, professor, counsellor, workshop leader, facilitator or concerned parent, equipping young people with social skills and providing them with the opportunity to explore values will help them develop their potential and inspire them to make a positive difference by putting their values into practice in the world. The eight values units in Living Values Education Activities for Young Adults, Book 1 are Peace I, Respect I, Love and Caring, Tolerance, Honesty, Happiness, Responsibility, and Simplicity and Caring for our Earth and Her Oceans. It is designed to be used in the first year of implementing the Living Values Education approach and in alternate years. The eight values units in Living Values Education Activities for Young Adults, Book 2 are Peace II, Respect II, Cooperation, Compassion, Humility, Another Value We Love, Freedom and Unity. It is designed to be used in the second year of implementation and in subsequent alternate years. 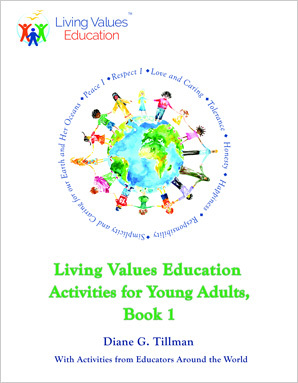 The sixteen values units in the two updated and expanded Living Values Education Activities books include other related values such as kindness, fairness, determination, integrity, appreciation, diversity, gratitude, inclusion and social justice.